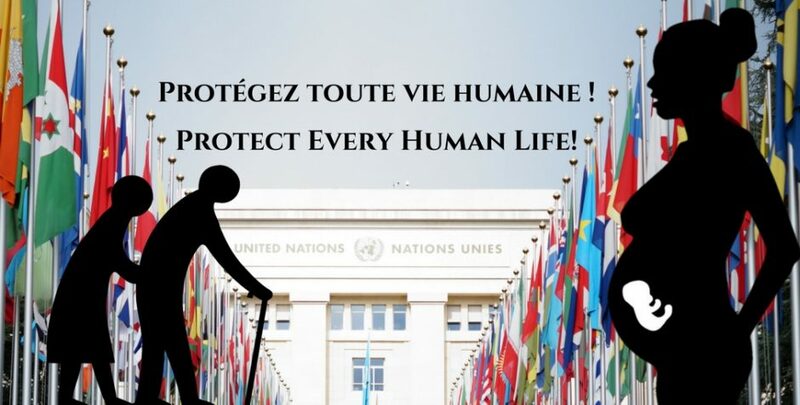 The UN Human Rights Committee wants to impose the universal legalization of abortion and euthanasia. Update (October, 6th, 2017): the ECLJ has submitted its Contribution to the Human Rights Committee. You can still sign the petition to support our work and receive our newsletter. You may read here our Press release & the Memordandum. Update (October, 31th, 2018): the Human Rights Committee adopted its General Comment. The UN Human Rights Committee is currently revising the definition of the “right to life” in international law. It contemplates imposing on every State the legalisation of abortion, of assisted suicide and of euthanasia, in the very name of the right to life! These lobbies of the “culture of Death” are about to win a decisive victory, in the greatest discretion. The final text will be adopted in the upcoming months. It is still possible to stop this manoeuvre. Support the action of the ECLJ before the Committee in co-signing the pleading that it will submit and in sharing this alert. This Committee, composed of 18 experts, is in charge of writing an official interpretation of the dispositions of the International Covenant on Civil and Political Rights (1966). This interpretation, called “general comment”, has a considerable power on legislators and national jurisdictions for this Committee also has the power to “judge” the States on their respect of this treaty. In doing so, the draft on general comment denies any protection to human life before birth and urges the 168 State Parties to the Covenant to legalise abortion on demand. The text gives no real condition or time limit to the “right” to access to abortion which should be available as soon as carrying the pregnancy “would cause the woman substantial pain or suffering”, whether “physical or mental”. Moreover, the draft condemns, without defining them, the requirements that States impose to legally access abortion insofar as they would be “humiliating or unreasonably burdensome”. The draft also reckons that States have the obligation to ensure access for adolescents to the use of contraceptive methods as a means to better preserve the health of women against the risks caused by abortion. In a previous version of 2015, the text recognized at least that States could adopt measures aiming at protecting the potential human life or the dignity of unborn children. Abortion was hence still a form of exception. But the majority of the committee decided in March 2016 to remove any reference to the child, reckoning, according to one of its members, that “it did not appear necessary to mention the right to life of the foetus”, as if human life started but at birth! One must yet note that this text does not reflect the convictions of all members of the Committee, far from it! The discussions among the Committee show on the contrary that this project is more the work of an active minority. It is thus possible to have it modified. This general comment is an obvious try to impose obligations that the majority of States have constantly refused. Even more, these new “obligations” are opposed to the text of the Covenant and the intention of the States that wrote and adopted it. In 1947, the writers of the Universal Declaration of Human Rights (UDHR), of which the Covenant of 1966 is ensued, discussed the beginning of the right to life. While it was proposed to guarantee that “Everyone has the right to life and physical integrity from the moment of conception regardless of his or her physical or mental condition”, the People's Republic of China, supported by the United Kingdom and the USSR obtained that the practice of abortion be tolerated. The Universal Declaration could then be interpreted as protecting, or not, life from conception, but never as imposing the legalization of abortion. The Covenant incidentally prohibits death penalty for pregnant women out of respect for the life of the child. Since then, the majority of States has constantly rejected the Western attempts aiming at asserting the existence of a universal right to abortion, notably during the conferences on population, development and women in Cairo and Beijing. The current draft on general comment is thus opposed to the intention of the writers of the Covenant, to the will of States and even to the letter of the treaty. It is also hardly compatible with numerous other international treaties. How can one logically deduce a right to death from the right to life? The European Court of Human Rights already declared that impossible in 2002. How can one ignore the life and humanity of an unborn child? Even the European Court never declared the existence of a right to abortion nor totally denied the unborn child the quality of human person and the protection guaranteed by it. This project is critical because it renounces to recognize the very existence of human life before birth, leaving it without protection towards abortion and all forms of manipulation and exploitation, notably biotechnological. It is also sadly revealing that the draft says little or nothing about the protection of women who wish to give birth to their children, nor on infant health and even less on the obligation made to States to prevent the recourse to abortion. This text shows a critical decline of the protection of the right to life. As a Non-Governmental Organization holding special Consultative Status before the United Nations (ECOSOC), the ECLJ will submit a written memorandum to the Human Rights Committee, on the 6th of October, on the last day to submit contributions. To reinforce this memorandum, we invite you to massively support it by signing here. The members of the Committee in favour of the right to life need our support and encouragement!